Guernsey FC boss Tony Vance praised his side's second-half showing as they won 2-1 at Walton & Hersham. Dominic Heaume struck early for Guernsey and Ross Allen got a 69th-minute winner after Andrew Mensah has levelled just before half-time. "We had to get the boys up for a battle and a fight - and in fairness in the first half Walton were better than us," Vance told BBC Radio Guernsey. "Second half we started off a bit wobbly but then we grew really strong." 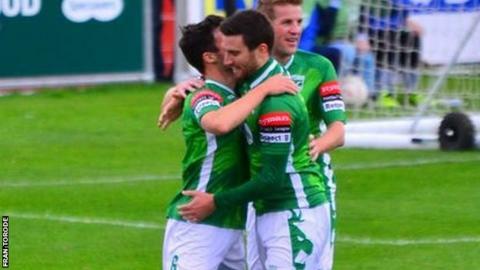 The win was Guernsey's second victory in six matches and their first win away from home in almost a month. "Craig Young went into central midfield and I thought he was outstanding and really set the tempo for us," added the Guernsey boss. "It wasn't pretty but we had to fight for the opportunity and fortunately it came via Ross at the end - and two sublime assists from Guille Fernandez."